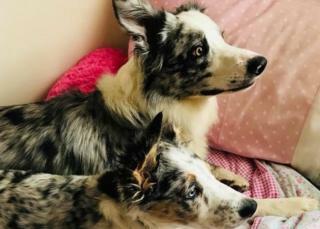 A runner who broke her leg on remote moorland was rescued after her dogs raised the alarm.Pita Oates, 48, was left unable to stand after she fell on a three-mile run in Lancashire with her blue collies Buddy and Merlyn.One of the dogs stayed with her as she inched down the hill, while the other ran around barking for help.This attracted the attention of another dog walker who contacted emergency services.Ms Oates, from Leyland, said: "They were like a tag team, Buddy never left me while Merlyn went for help. "I would have died without a doubt, I wouldn't have lasted the night. "When help arrived Ms Oates, who had left her mobile phone in her camper van, was drifting in and out of consciousness and starting to suffer the effects of hypothermia.She said: "It was the tail-end of Storm Gareth, it was freezing and I was soaking wet. The winds were horrendous." Ms Oates broke the femur behind her left knee and tore her anterior and cruciate ligaments on the run on Great Hill near Chorley on 12 March. "I couldn't stand up, I was having to bum-shuffle all the way down," she said. "Every time my leg touched the ground I was in pain so I rigged up a sling using the dog's lead to keep my leg up. "It took her 90 minutes to get down the hill by which time it had gone dark. "Buddy never left me and Merlyn kept barking back at him - when this man came with his dog he knew something wasn't right," she said.She spent eight days in hospital and had a titanium plate fitted but still needs another operation.